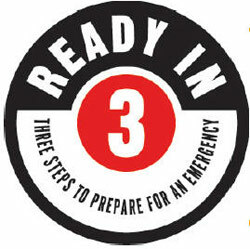 The Glendale Fire Department periodically hosts Ready in 3 classes. This one hour class is a resource to help citizens to prepare for numerous types of emergencies such as earthquakes, tornadoes, or even man-made disasters. For citizens interested in taking a more active role in disaster preparedness in the community, the Glendale Fire Department will also be hosting CERT classes. The Community Emergency Response Team (CERT) Program educates people about disaster preparedness for hazards that may impact their area and trains them in basic disaster response skills, such as fire safety, light search and rescue, team organization, and disaster medical operations. Using the training learned in the classroom and during exercises, CERT members can assist others in their neighborhood or workplace following an event when professional responders are not immediately available to help. CERT members are encouraged to support emergency response agencies by taking a more active role in emergency preparedness projects in their community. For more information on attending these classes, please contact Captain Chuck Helle at 314-965-7097.